THEHANSENFAMILY: FINALISTS FOR THE MODERN WORLD AWARDS! FINALISTS FOR THE MODERN WORLD AWARDS! 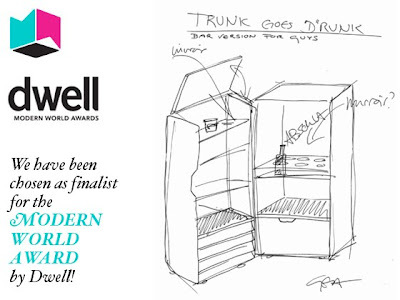 We got chosen by dwell as one of the finalists for the modern world awards in the category "PLAY" with our "DRUNK"! "We are proud to announce the first ever Modern World Awards and Ceremony this year at Dwell on Design. Every day we scour the wide world of design for the best products, objects, and furniture for our magazine and website. And now we are very happy to stamp our seal of approval on our favorite 25 designs from the last year and a half at the first Modern World Awards exhibit and Ceremony. The awards will be handed out in a special presentation at Dwell on Design at 5:00 on June 24th. If you can't make it, don't fret. The 25 designs will be exhibited on the show floor throughout the three days of Dwell on Design. Taken directly from the pages of Dwell, the five finalists we've selected in in five different categories best encompass our take on how the modern world, and how good design improves it. Whether at work or play, at rest or on the go, these are the designs that matter most. As usual, we're looking for innovation, clever use of materials, sustainable design, and that je ne sais quois that makes us say, "I gotta get one of those."